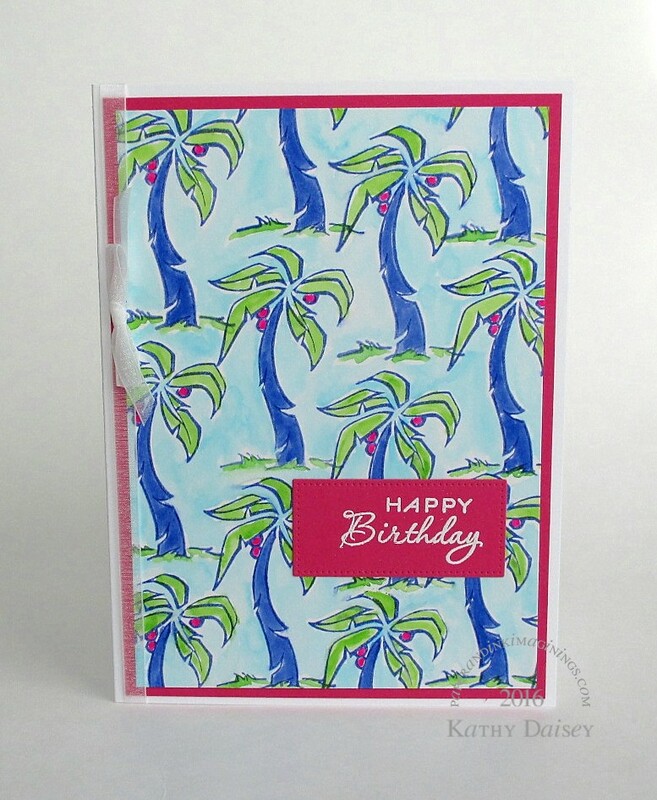 Remember the watercolored palm tree background from a few weeks ago? Here is the birthday card I made with it. I thought about adding sequins or jewels, but it just didn’t work for me. This card is for personal use, and I made it large – 5 x 7 inches. Supplies: Stamps – Papertrey Ink, Stampin’ Up!, paper – Neenah Classic Crest Solar White, Stampin’ Up! Melon Mambo, Strathmore Bristol, inks – Papertrey Ink Fresh Snow, TimHoltz/Ranger Distress Inks Blueprint Sketch, ZIG Clean Color Real Brush Pens Cobalt Blue (31), Green (40),Light Green (41), Pink (25), die – My Favorite Things, embossing powder – Filigree Fine Art Powder white, organdy ribbon – Offray. Categories: birthday, card | Tags: card, My Favorite Things, Neenah, Offray, Papertrey Ink, Ranger, Stampin' Up!, Strathmore, Tim Holtz, ZIG | Permalink.